These articles will, it is hoped, prove of interest to the family members. We are very anxious to secure more from other members - all contributions will, as they say, be gratefully received! For the article, simply click on the title in the left-hand column. Jane Orford née Goffée (1837 – 1897) was the wife of George Gowlland (1838 – 1911), and mother of several Gowlland children whose successors are still living. The father of Jane's Goffée, Jane's mother, was Thomas Goffée, a weaver in the Whitechapel area. His family was reputed to have been Huguenots, and it was said that they had fled France just before the revolution in a fishing boat which took them up the river as far as Greenwich. Thomas Goffée married Jane Davenport at St Luke Middlesex on 26 January 1816 (click here) - note that Jane was illiterate and signed with her mark. The Goffée family in France was supposed to have been prosperous but could only bring away with them in their haste their portable valuables such as jewellery. One of Mme. Goffée’s sisters married another Huguenot named Le Beau from Canterbury. Thomas and Jane had three children, all baptised at St Mary, Whitechapel, Jane (29th May 1816) (click here - note her mother must have been several months pregnant at the wedding), Mary Ann (30th Nov 1817) and Mary Ann (30th May 1819). Jane, the oldest of their three children, married Henry Orford at St Leonard's, Whitechapel, on 28th June 1835 (click here) - note Jane was illiterate and signed with her mark. They had two children, Jane (b 1837 - here) and Henry (b 1839). The Orford family was said to have come from Norfolk, being once wealthy: in the middle of the nineteenth century they still owned extensive property. They were chiefly concerned with their timber business, which had been built up over several generations. 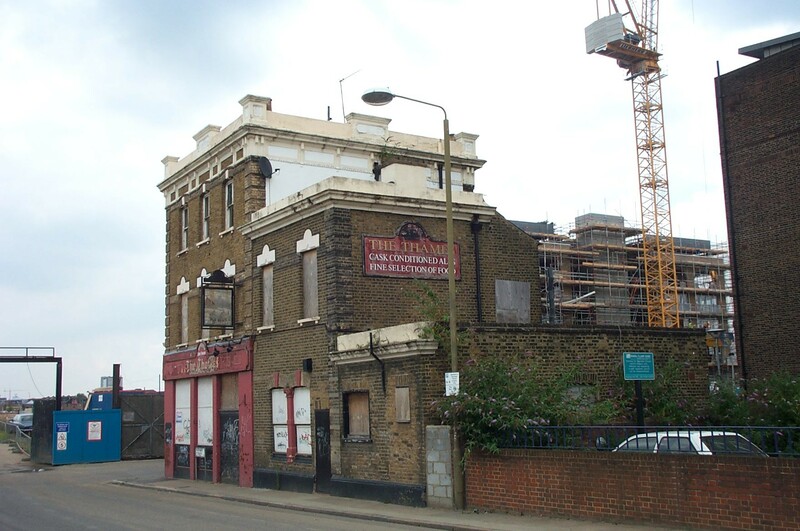 In the latter part of the nineteenth century they lived in Bridge Street (now renamed Creek Road) Greenwich, S.E.10 and their timber yard was behind the house on the dockyard in the side of Deptford Creek. In 1941, when visited by Geoffrey and Egbert Gowlland, it was known as Dowell’s Yard and had office buildings dating from about 1840 or so. In Thames Street at the rear were further contemporary buildings in the Gas Works yard. In the 1841 and 1851 censuses (click here and here) Henry and his wife Jane, with their two children confusingly named Jane and Henry, are living in St George in the East: Henry's occupation is shown as "Sawyer". 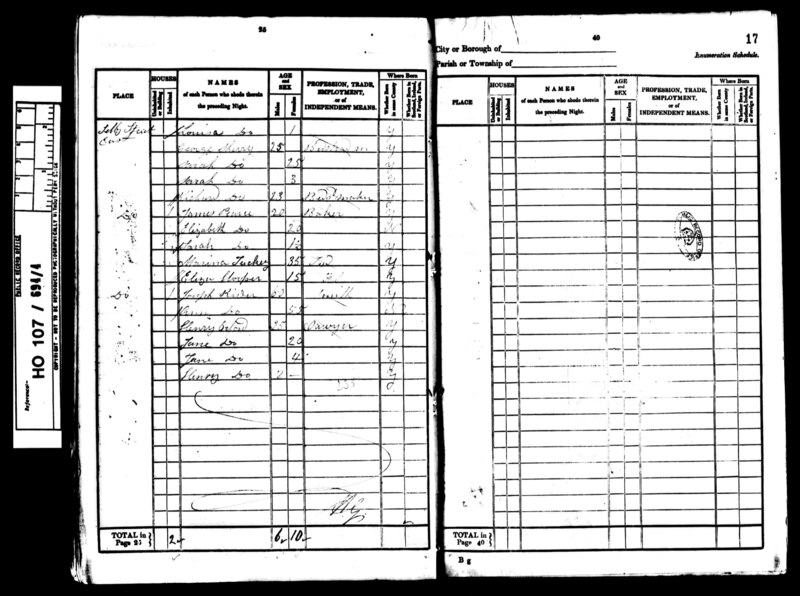 About 1880 - 1890 a Henry Orford (click here for his birth certificate), uncle to Jane, owned the Orford properties, including the timber yard. His business was chiefly importing deal [fir or pine wood] from the Baltic and he owned a large fleet of barges. [Egbert Gowlland remembered, as a boy being taken to Bridge Street and playing in the Orford barges in their docks]. At that time the family was still wealthy, possessing the timber business, lightering, and property. However Henry appears to have been a bad manager and a heavy drinker. He signed himself as a saw-maker in his niece's marriage register entry. The older child, Mary Jane Orford (click here for her birth certificate) worked as a demonstrator at Singer's Sewing Machine Co., and was at the Anglo French Exhibition at South Kensington for them. Their mother never emerged, and it was thought by Jane, who was very puritanical in outlook, that these children were, in fact, illegitimate. On Henry's death an unsettled lawsuit caused the estate to be taken into Chancery and dispersed. The wharf was closed and rents money taken into Chancery. On Henry Orford's death, Mrs (Goffée) Orford had promised that the estate should go to Jane. Mrs. (Goffée) Orford was a strict Protestant and detested her son Henry's loose behaviour. Henry left an unreliable will (see below) leaving it to his children. Jane Orford had laboriously saved up £600 of her own money, and this she spent on lawyers’ fees and legal costs. Her solicitor was a Mr Norton of Kingsland Road. She entered a caveat alleging that Henry was unfit to make a will and unduly influenced by his children; and that her mother's promise should be implemented. The action was indecisive and the estate was taken into custody of the Chancery court. Gladys Gowlland in 1955 [GPG’s notes state “Gladys/Gertrude”, but it seems pretty clear that his informant was Gladys] wrote that it was said that Jane was finally offered £600 in gold sovereigns to settle the case. After some consideration she decided not to accept and loaded all the money into a perambulator and wheeled it back to the lawyers. This was said to be the reason for the quarrel with her husband George who insisted she should have accepted. The failure of her action left Jane very embittered and she died a few years later on 19th May 1888 (click here for the death certificate), her death undoubtedly hastened by ineffectual brooding on the case. Jane (Orford) Gowlland had many of her mother's French characteristics, which she passed on to her elder daughter, Margaret. She was rather short, very thrifty, straight-laced in outlook. She had kept (according to Mrs. Beatrice Louise Gowlland, Egbert Gowlland’s wife, in March 1955) a very detailed and beautifully written diary. Geoffrey Price Gowlland remembered seeing some beautifully written pages of a diary. Charles Septimus Gowlland wrote on 14th January 1962: "There were three volumes bound in green vellum in a case with a glass front about 8 "x 6". They were a history of the Le Beau's, the Orfords, her own private diary and also a lot of old history of the Gowllands. I saw the case last when Gertrude was married [presumably his younger sister, born 1880, who married Samuel Gosland June 1901]". GPG re-visited the area on 15th May 1955 with his father Egbert. St. Alphege’s Church had been fully repaired. 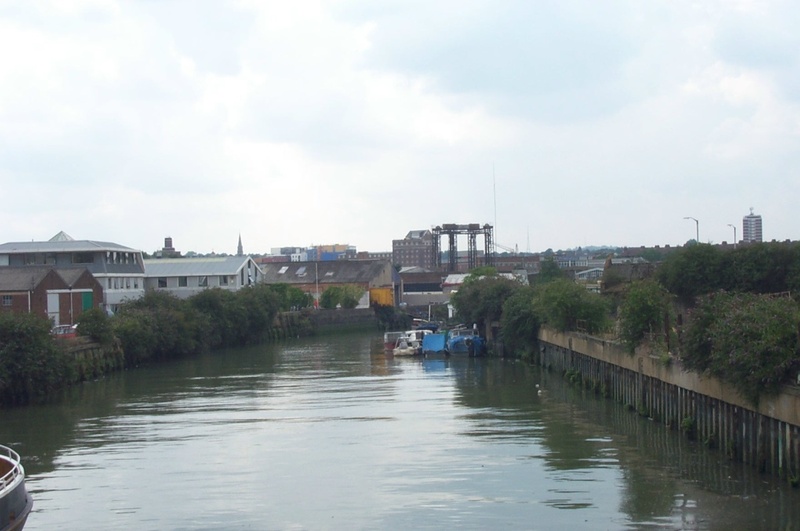 Donell's yard was still a flourishing coal yard, and extensive rebuilding of the next wharf towards the river altered the appearance of the mouth of the creek [Egbert Gowlland remembered more of the barges than the wharf]. On this visit GPG drew a sketch map, which is shown below compared with the contemporary equivalent. The Orford’s shop seemed to have vanished although nearly all the houses in Creek Road were late eighteenth century. The shop was a double fronted, rather low building, with the living quarters behind. There were large central double doors and on each side were examples of some of the Baltic deals in which they specialized. Egbert Gowlland thought that the number used to be 12, and it might have been located opposite Donell's Wharf where some of the homes were demolished (probably about 1910) when the swing bridge over the Ravensbourne river was built. An old stone "Bridge Street" could be seen nearly opposite Donell's wharf. In 2005 John Gowlland visited the location. 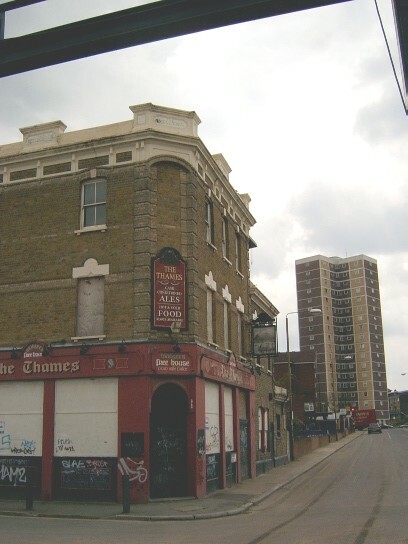 Norway Street, where the Orford's office was, is being redeveloped and only one Victoria building remains, a public house [see below]. Other than this single building, nothing else would be recognisable to the Orfords. Margaret Gowlland was the closest to the Orfords as she often stayed with them. Jane (Orford) Gowlland bought a big grave in Finchley Cemetery, North London, topped by a big stone for Arthur (1862 – 1883 - her second child and first son) on his death. Many of her children have been buried there. Goffee, could never work out where they fitted in,we are still not sure. baptised in Biggleswade where their father Thomas was a wheelwright. St Martin in the Field. deceased child is in the eight,if not we still have two children to find. parents, brothers & sisters, or how Henry may be related. Here I was thinking I would have an instant proof of relationship, family history not that simple is it, with its many twists & turns, never mind we will keep on working on our past. Some interesting family bits & pieces, I was always told the Orfords were in the timber business. The photo of Henry 1814 has a strong resemblence to my grandfather, the strong jaw bones & tilt of the head (I will have to scan it so I can send it to you at some stage)I have often seen my grandfather with the exact same expression. As for Egbert this a typical Orford slant on life, dont wast time on the past the present much more important. My dad very irritated by my interest in his families past, not of any importance at all. He did not know a very much wasn't interested, so I had to dig deeper with some of his uncles, guess what, they were nealy the same. Thank goodness they could show a little light on things & thank goodness for the internet. One story told me by one of dads cousins handed down to him by his father. The Orfords came from Belgium were artisans with wood by the name of Offaire, they changed the name after the troubles with France anglising the name to Orford (only trouble I cant find any reference to that name anywhere) have found Orfeur however that name still in use. The Orfords came to London after the great fire of London to help rebuild the city. Their knowledge of timber and its craft put to good use. ???? I dont know how much truth in this. Dads cousin has a Belgium ladies smoking pipe said to have been in the family for generations, however these also became available in England & quite common in use by the ladies who could afford to buy the tobacco. So we travel on sorting out fact from fiction. Mortgage 0/64/020/ 1875 Henry Orford,John Hewett Furze,William Furze, Ramsholt Lodge, Woodbridge, Suffolk,esq; contents. Mortgage 0/064/021/1878 Henry Orford, John Henry Furze,William Furze,Alfred Furze,& Walter Furze, St Georg's Brewery, Whitechapel, Middlesex, contents. There was also a reference to a divorce settlement however could not find it later, just goes to show I should make more precise notes as I go along. I will also forward Gwen Orfords email to you with photo of Henry and Jane Goffee. I cant contact Gwen at the moment as she & husband Doug away on a little trip. Doug a descendant of James who emigrated to Aus. & the family who originaly had this photo in Aus. Will see if it is OK to put the photos on your web site when they get back home. Thomas Sankey Gowlland and the Isles of Scilly. Thomas Sankey Gowlland was born in Canterbury in the county of Kent and was baptised there at the chapel of the Countess of Huntingdon’s Connection on 15 November 1805, having been born about three weeks earlier. He was the ninth child and fourth son of Richard Symons Gowlland and his wife Sarah née Sankey. Thomas apparently joined the Navy and later transferred to the newly re-formed Coastguard service in April 1827. By the time that he was posted to the Isles of Scilly he had been married to Mary Ewing for seven years. Their marriage had taken place in Columbkill, County Donegal in Ireland on 20 September 1831, when Mary was about nineteen years old. The service was conducted by James Ewing, clergyman brother of Mary. One of the witnesses was another Chief Officer of the Coastguard. Their oldest child, Annie, was born in Ireland about 1832. After serving at four coastguard stations on the West coast of Ireland, Thomas was next posted to Shellness on the Isle of Sheppey off the north east coast of Kent in England. Here Mary Louisa was born about October 1834 and John Thomas Ewing about June 1838. Then on 28 December 1838 Thomas was posted to Tresco on the Isles of Scilly. These are about 28 miles off the south west coast of Cornwall and are the last outcrops of habitable land before the Atlantic Ocean. Before the days of railways and with the state of then un-metalled roads in England being very poor, especially in the middle of winter, it would seem likely that the move from one island to another took place by sea. It is probable that they would have sailed along the south coast of England to Penzance and then taken another boat to St. Mary’s, the largest of the islands. Although today there are regular flights by aeroplane and helicopter (unless the weather is unsuitable for flying) the main access is still by boat to the harbour on St. Mary’s. The first report of a regular boat service between Penzance and Scilly was in 1827, and the original intention was simply to carry the mail needed to convey orders for vessels calling at Scilly. At the time when Thomas was travelling there were sailing boats assigned to this route, but the journey is still very uncomfortable in rough weather and so was probably really unpleasant for the family with their three young children. Today there is a purpose built boat for conveying all goods such as building materials and food etc. and, of course, people. But even now "The Scillonian" does not run regularly out of the main holiday season. The Islands of Scilly belong, then and now, to the Duchy of Cornwall. The present Duke is Charles, Prince of Wales. Just before Thomas and his family arrived, life on Scilly was in major decline, especially on the off-islands (i.e. all except St. Mary’s). There were various reasons for this, mostly economic but also partly to do with the geography of the islands. Many were the result of absentee and disinterested landlords. Even a subsistence existence for the indigenous population relied almost entirely on what the land and sea could provide. So events like the failure of the potato crop, the collapse of the kelping [seaweed for fertiliser] industry and changes in the system of licensing pilots for incoming ships had a detrimental and cumulative effect. In 1832 a Select Vestry was set up as an administrative body and this produced some positive results. But the most important change took place in 1834 when Augustus John Smith took up the lease of Lord Protector from the Duchy of Cornwall and his tenure as a personally involved resident of the islands had an enormous impact on their life. He decided that part of the reason for the decline of the islands was due to the system of land tenure, whereby there were scattered smallholdings, much subdivided. His changes meant that only one son could succeed to property, any other children having to find employment elsewhere. To ease unemployment problems among the surplus population, he set them to build roads and granite-walled boundaries. Being already an experienced landowner in Hertfordshire, he introduced some new initiatives, including the cut flower industry which took advantage of the mild climate for early bulb flowering and this was helped by the growth of the railway network, which also brought tourists to the island. During this time a ship building industry became well established and provided much needed employment. Between 1837 and 1878, forty-eight vessels with a total tonnage of 4,610 tons were completed, but this later declined due to the coming of iron and steel ships and steam power. Among other changes he insisted that all children should have some formal education, forty years before this became compulsory on the mainland. The older boys were taught navigation and this proved very beneficial to them in adult life. But it is not known if Thomas’ children went to school – it seems most likely that they were taught at home by their aunt, Mary Ewing. Until 1837 the only warning navigational guides visible from the sea were the lighthouse on St. Agnes and the Day Mark on St. Martins. Over the centuries many vessels ran aground on the rocky shore all around the islands. Perhaps the best known such incident was in September 1707 when Admiral Sir Cloudesley Shovel, sailing from Gibraltar to England, lost five from his fleet of twenty-one ships, wrecked on the Rocks of Scilly, when navigational errors resulting from ignorance of the ships' longitude gave an incorrect position for the fleet: two thousand sailors perished. It was this disaster which prompted the Government in 1714 to pass an Act of Parliament (The Longitude Act), which promised a prize of £20,000 (an enormous sum in those days) to anyone who could solve the problem by any means that was "practicable and useful" and, crucially, could guarantee to establish a ship's longitude with half a degree (about thirty miles) at the end of a voyage of several weeks from England to the West Indies. Eventually this resulted in the series of Harrison chronometers, which were the first time-keepers able to maintain the time with sufficient accuracy for longitude to be known with certainty. 'Wrecking’ (the retrieval of any sort of goods washed ashore) was an important feature of island life, especially amongst men, as a means of subsidising their way of life. There was some smuggling too, the bulk of the goods being luxury items such as brandy, rum, wine, tobacco and tea. Since the reorganisation of the coastguard service during the 1820’s it had become much more effective. Thomas was a typical example of a man who was posted away from his place of birth and upbringing. In 1831 the population was 2,465. By 1841 this had risen to 2,568 and by 1851 to 2,606. At the time of the 1841 census (taken in June) Thomas and his family are listed at the address Dial Rocks on Tresco. The family group also included Mary Ewing, born in Ireland and an aunt of Mary. One wonders if she was very frail when born and not expected to live. In fact, she survived until her death in 1924. One of her direct descendants is married to a Scillonian and lives with her husband on the off-island of St. Agnes. Dial Rocks appears on the neck of land between New Grimsby and Old Grimsby (the original name was Grinsey). It contains the vast majority of the old buildings in Tresco. One cottage in a row of four in Dial Rocks is now (2005) called Coastguard and it is possible that this is a typical example of the type of official dwelling that would have been provided for Thomas and his family. ‘The off-island registers are supposed to have been copied into the St. Mary’s registers. Where this has been done entries have been duplicated, but there are many instances where this has not been done’. 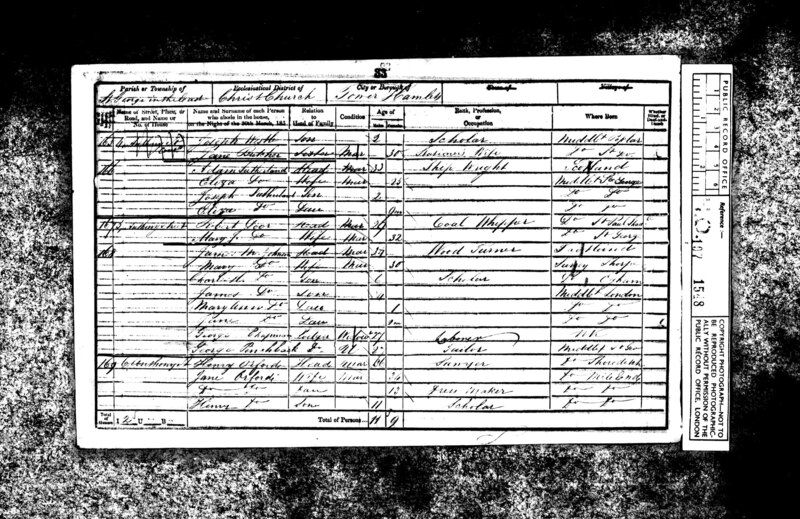 But the baptismal record for Richard Sankey Gowlland on 25 December 1846 is listed in the St. Mary’s register. After ten years on the Isles of Scilly, Thomas’ last posting was in February 1848 to Leigh on Sea beside the River Thames in Essex and there the youngest three children were born. He retired from the Coastguard service with a pension in August 1847. He died in Crayford in Kent in February 1872, his wife having predeceased him by ten years.